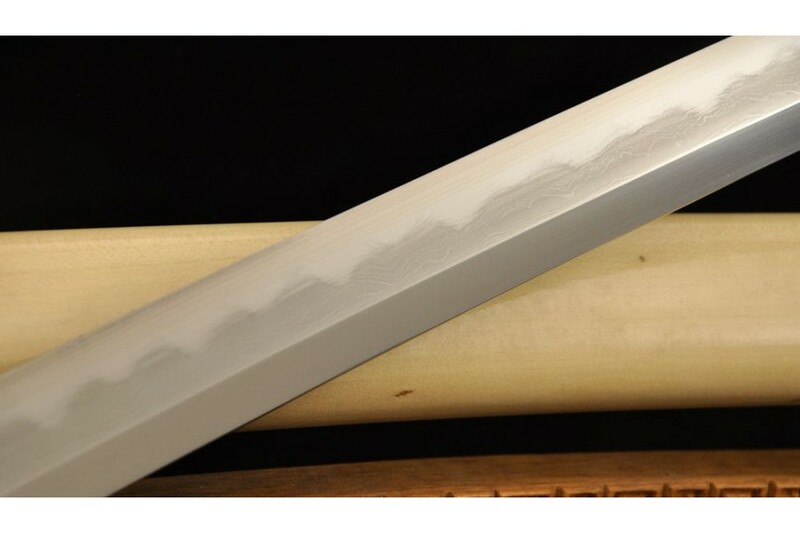 The blade of this Shirasaya sword has been constructed of damascus folded steel. Clay temper results in the real hamon and blade has been polished to a mirror polish using Japanese water stones. The masame folding pattern is clearly visible. The blade comes full tang and sharp, two bamboo mekugi secure the tang of the sword into the tsuka. NO-HI (blood groove) is to enhance the power for cutting. 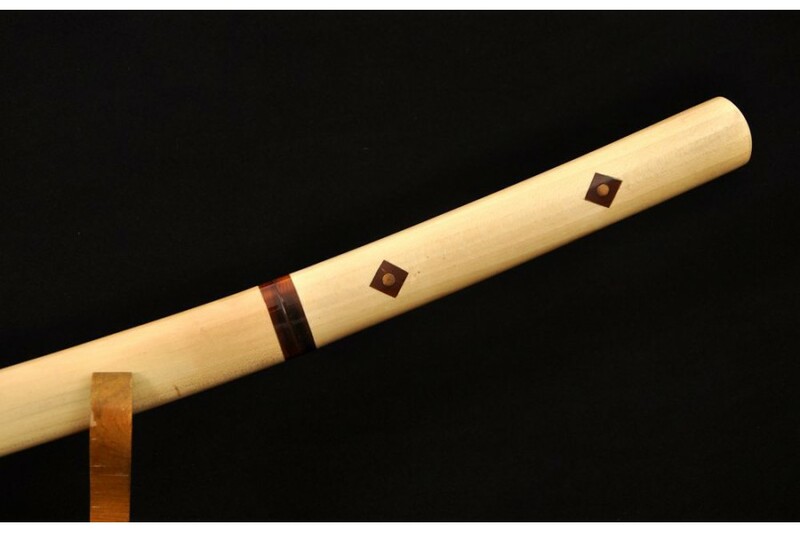 The handle and saya are both made of hard natural wood and bull horn koiguchi (the mouth of the scabbard or its fitting). It has no tsuba (guard) of the sword, the Habaki (blade collar) is a one piece brass construction. Hand Forged ZATOICHI Japanese Sword Ninjato ShirasayaThis ZATOICHI is fully hand forged and hand sharpened using Japanese methods to create a perfect blade. Fully functional and battle ready. The blade was made of folded steel. High Carbon Steel are folded 13 times creating 8196 layers for superior strength and flexibility. the visible tenuous undulating grain on the blade was resulted from folded repeatedly during forging.The Saya scarbbard is crafted from hard red wood and Koiguchi (sca.. 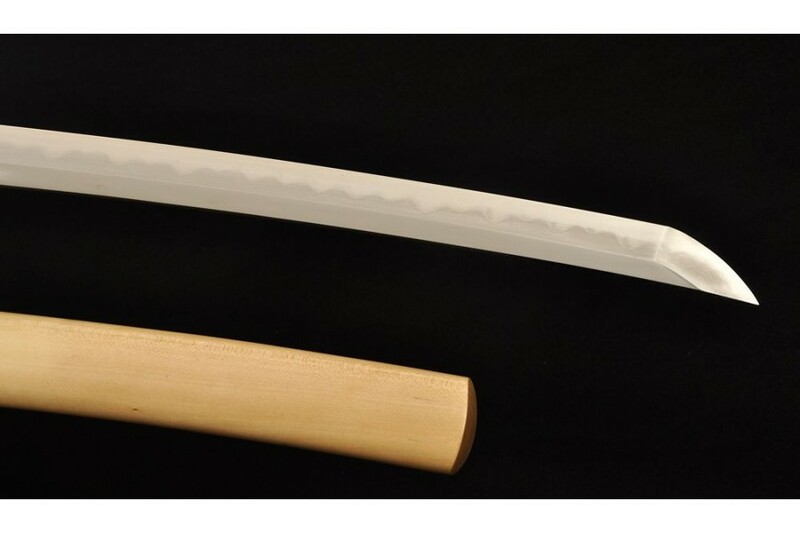 This Shirasaya Wakizashi Sword is made of 1095 high carbon steel, clay tempered with a polished mirror-like surface. It is a very strong blade made with traditional methods, for multiple applications. The blade is repeatedly heat treated and hand forged to remove impurities. The clay temper process combines the characters of toughness and flexibility and results in a genuine hamon (temper line). The blade is full tang and hand sharpened, suitable for battle. This blade has a shape in "Unokubi-Zu.. This Tanto sword is hand forged and hand sharpened by Japanese methods to create the perfect blade for iaido and kenjutsu use. Fully functional and battle ready. The 1095 high carbon steel blade has been throughly refined and tempered, a special clay is applied to the blade by hand, using a thin covering near the edge and a thicker layer over the rest of the blade. 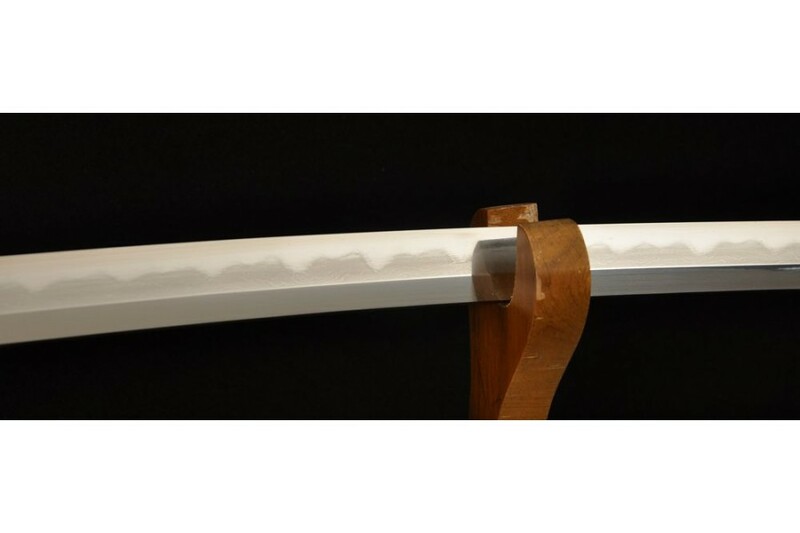 The beautiful hamon on the blade is result from the differential cooling of the blade(quenching and tempering). The blade has been h.. 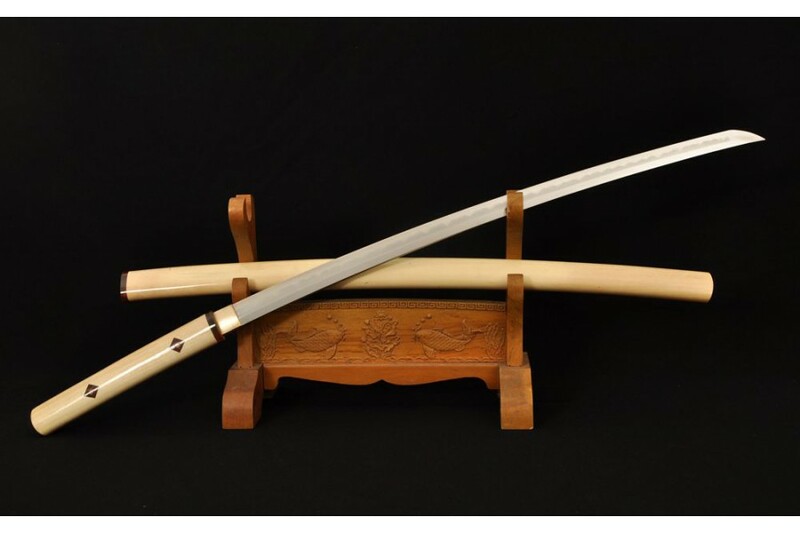 This japanese sword has been hand forged using the ancient method of sword making. 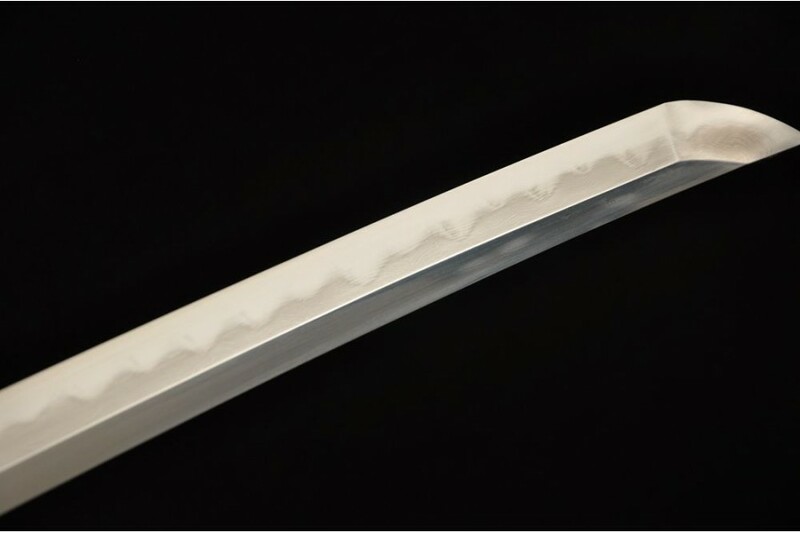 The blade of the sword has been constructed from 1095 high carbon steel, and the blade has been clay tempered and water quenched, so you can see the beautiful hamon on the blade, this is result from the differential cooling of the blade. 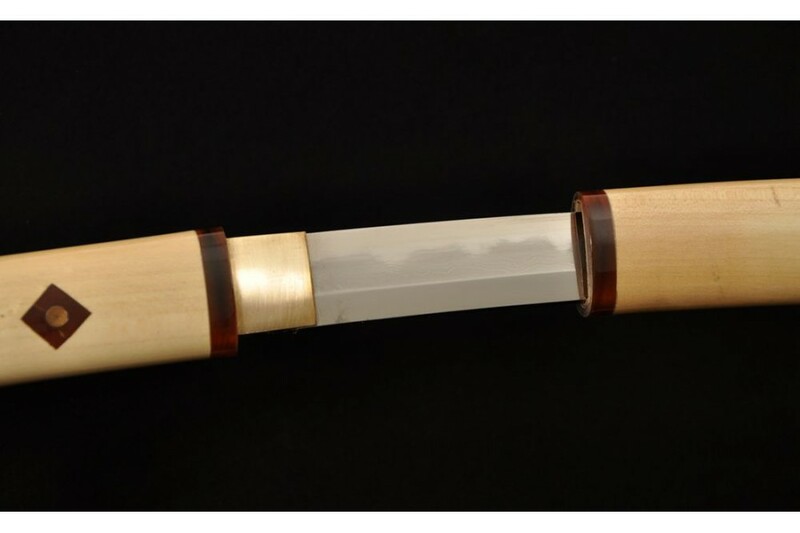 The blade has a sharp in "Unokubi-Zukuri" style, there is one big Hi(blood groove) on each side which is from Habaki to the middle of the blade, the thickness on the back becomes .. 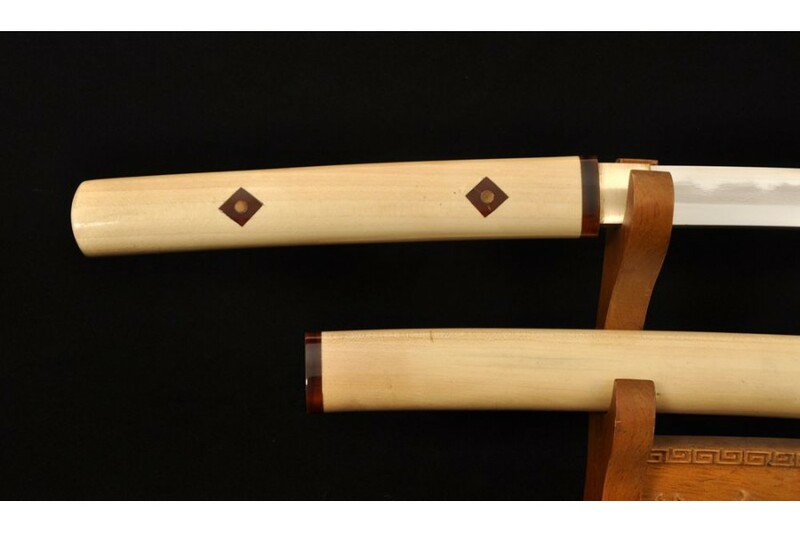 This Japanese sword set has been hand forged and hand sharpened, it is fully functional and battle ready. 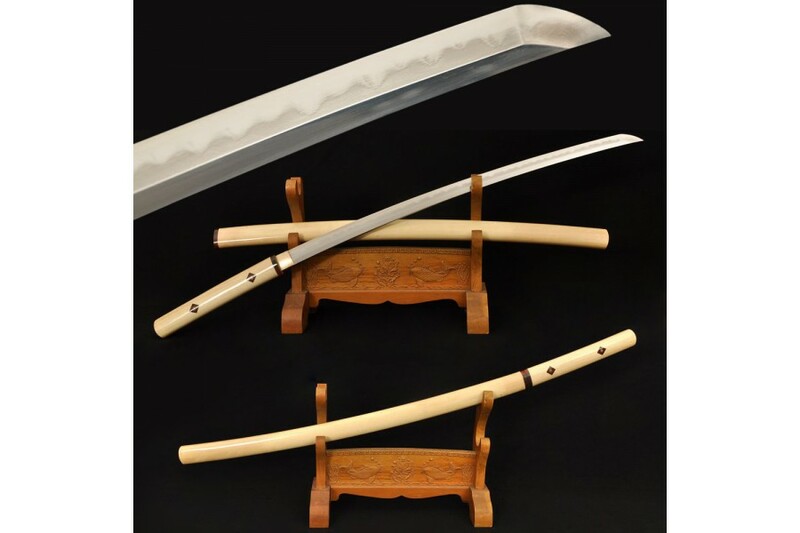 The blades of the sword set have been constructed from 1095 high carbon steel, and the blades have been clay tempered and water quenched, so you can see the beautiful hamon on the blades, this is result from the differential cooling of the blade. 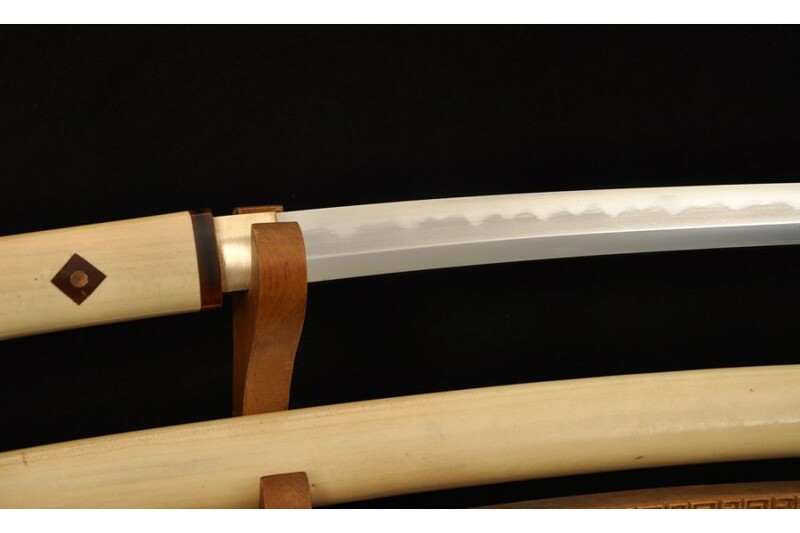 The blades have a sharp in "Unokubi-Zukuri" style, there is one big Hi(blood groove) on each side which is from Habaki to the middle of the blade, .. 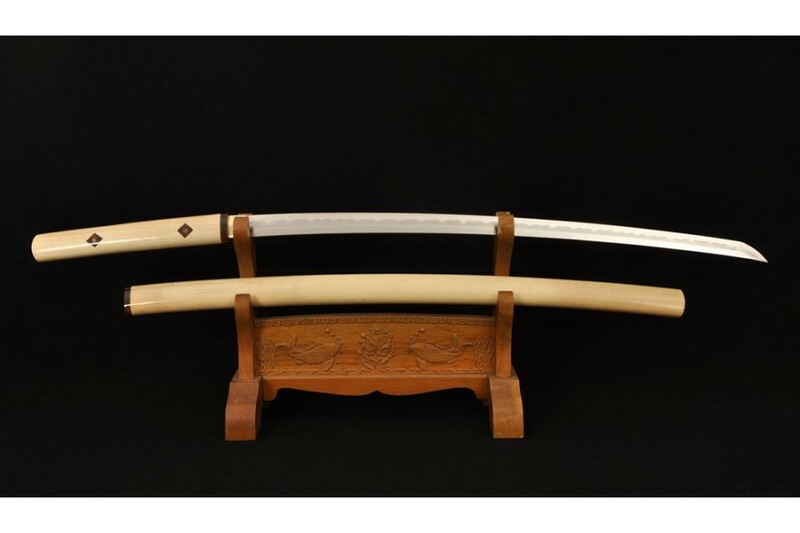 This Japanese sword Katana has been hand forged and hand sharpened, it is fully functional and battle ready. This sword is made of folded steel with 13 times folding to create the 8192 layers, which cast flexibility and hardness of the blade in a large degree, the visible tenuous undulating grain on the blade was resulted from folded repeatedly during forging, the whole blade was hardened by oil quenched, the blade has been special treated which create many red and black pattern on the blade. Th.. This Ninjato sword has been hand forged using the ancient method of sword making. The blade of the sword has been constructed from 1095 High Carbon steel in a Maru style. In accordance with Japanese tradition, the blade has been treated with a clay covering, applied to the entire sword except the cutting edge. The blade is heated and quenched in spring water. The combination of the quenching and the clay cover creates a significant temperature difference in the Ha of the blade and the rest of th.. 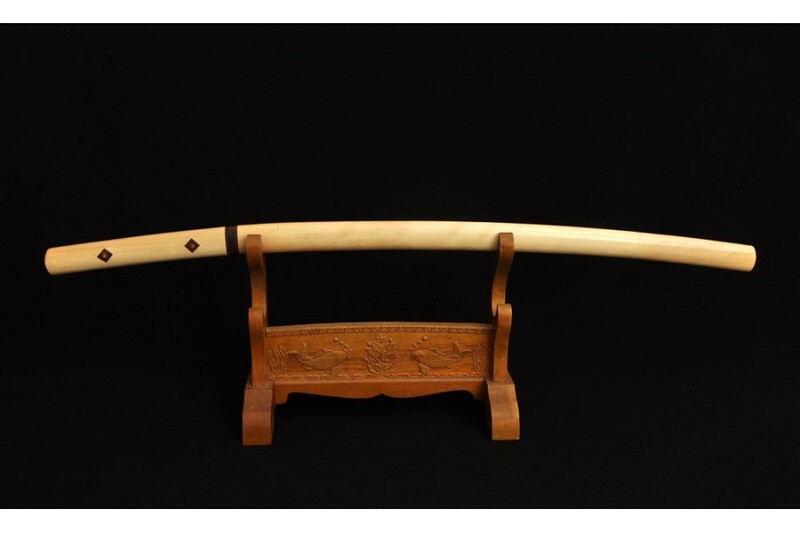 This Shirasaya sword is fully handmade by HonBon Forge with traditional technology. It is Damascus folded steel blade with special treated, which was made by repeatedly heating, hammering and folding the metal, creating subtle and visible layers on blade. The process of folding metal is to improve the strength of blade. Blue color on the surface of blade is made by electroplating, this not only looks beautiful but also can prevent the blade from rusting.There is a long bo hi (blood grooves) on e.. This Shirasaya sword is clay tempered folded damascus steel full tang blade. 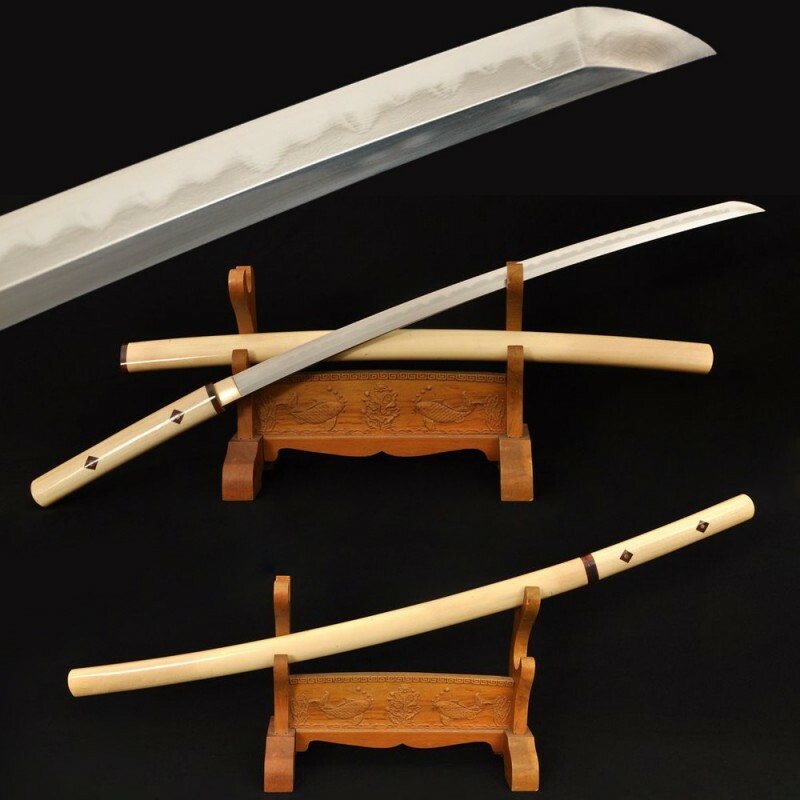 Folded steel has the capability to be a harder blade, the incredibly crafted blade that has both strength and flexibility makes a high-quality sword. The steel has been throughly refined and tempered, a special clay is applied to the blade by hand, using a thin covering near the edge and a thicker layer over the rest of the blade. Chu-kissaki on the top of the blade. It is special treated black color blade, preventing i..